When an employee stops showing up for work without warning, a job abandonment termination letter can let them know that they are fired. As it has now been two weeks since your last appearance at ABC Company, we are treating your unexplained and unauthorized absence as your resignation, which we accept. 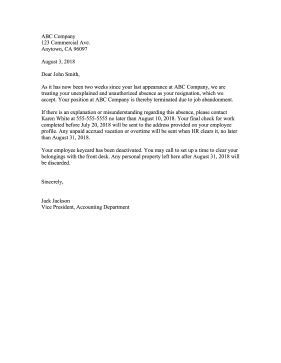 Your position at ABC Company is thereby terminated due to job abandonment. If there is an explanation or misunderstanding regarding this absence, please contact Karen White at 555-555-5555 no later than August 10, 2018. Your final check for work completed before July 20, 2018 will be sent to the address provided on your employee profile. Any unpaid accrued vacation or overtime will be sent when HR clears it, no later than August 31, 2018. Your employee keycard has been deactivated. You may call to set up a time to clear your belongings with the front desk. Any personal property left here after August 31, 2018 will be discarded.